One of the biggest challenges to the development of hydrogen as viable alternative to fossil fuels is the problem of storage. Current tanks can store about 2 per cent H2 by mass, whilst the US Department of Energy estimates that to be effective a tank should store 6 per cent. 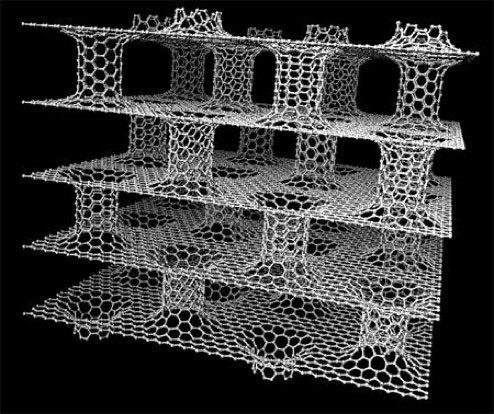 A team from the University of Crete has constructed a tank from Carbon Buckytubes connecting layers of graphene to form a huge matrix, which can theoretically store 6.1 per cent H2. A huge leap.